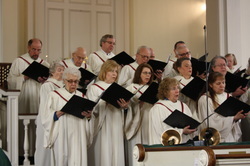 First Parish Church has a vital and engaging music program for all ages that seeks to “make a joyful noise unto the Lord” through robust hymn singing, choral songs and anthems, and the delightful sounds of choir chimes and handbells. Throughout the church year, we are fortunate to enjoy the music ministry of a wide variety of vocal and instrumental solos, duets and ensembles. An eclectic music program enriches the worship life of our church. ​​Our worship life is greatly enhanced by a three manual pipe/digital organ of 73 ranks including a brass Festival Trumpet stop, placed in en-chamade position in the balcony.. The organ is a centerpiece of our music ministry, capable of producing a rich variety of sounds, from gentle beauty to bold majesty. More details on the organ are here: Organ Information. Also located in the sanctuary is our Yamaha concert grand piano, frequently used as the accompaniment for our choirs and as a solo instrument. The First Parish Ringers is an inter-generational group of handbell ringers. This group is open to all high school students through adults. Rehearsals are Sunday evenings from 5:15 p.m. to 6:30 p.m. This group rings in church once a month and on special occasions. New members are welcome. It is helpful if you are able to read music. For more information, please contact Carol Seely at k9vet@rcn.com. The Joyous Ringers is a youth handbell group open to all youth Grades Four through Eight. This group meets once a week following Sunday School sessions, from 11:00 to 11:45 a.m.. and rings in church every few weeks. New members are welcome. This is a wonderful opportunity for the youth to become more involved with the music program of First Parish Church. For more information, please contact the director of Joyous Ringers, Emily Grondin, at katklawz11@yahoo.com. The Youth Choir is a group of children from kindergarten through middle school age who rehearse Sunday mornings from 11:00-11:30 a.m. on a rotating schedule with Joyous Ringers. New singers are always welcome. The choir sings in morning worship every few weeks and also for special services at Christmas and Easter. For more information, please contact the director of the Youth Choir, Carol Seely, at k9vet@rcn.com. First Parish Concert Series is a music ministry outreach to the church and the wider community. A variety of concerts are sponsored, from time to time. Recent events include internationally known keyboard artist Hector Olivera and virtuoso organists Diane Bish, Carol Williams, and Fred Hohman.